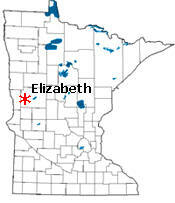 Elizabeth is a city in Otter Tail County, Minnesota. 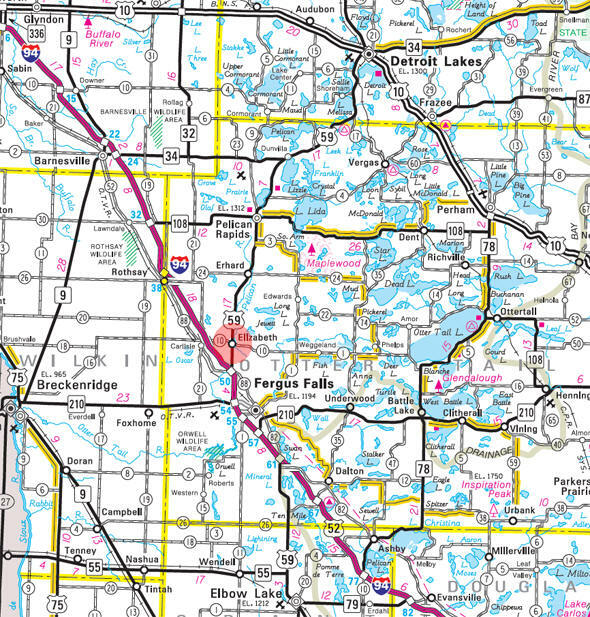 US Highway 59 and County Road 10 are main routes in the community.According to the United States Census Bureau, the city has a total area of 0.37 square miles (0.96 km2), all of it land. The elevation is 1,250 feet (381 m). As of the census of 2010, there were 173 people, 66 households, and 49 families residing in the city. 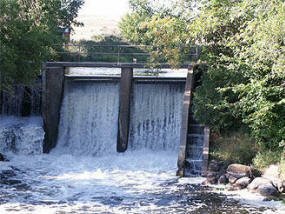 The population density was 467.6 inhabitants per square mile (180.5/km2). There were 84 housing units at an average density of 227.0 per square mile (87.6/km2). The racial makeup of the city was 93.6% White, 2.9% African American, 1.7% Native American, 0.6% Asian, and 1.2% from two or more races. There were 66 households of which 30.3% had children under the age of 18 living with them, 65.2% were married couples living together, 4.5% had a female householder with no husband present, 4.5% had a male householder with no wife present, and 25.8% were non-families. 19.7% of all households were made up of individuals and 3% had someone living alone who was 65 years of age or older. The average household size was 2.62 and the average family size was 3.08. The median age in the city was 43.8 years. 24.3% of residents were under the age of 18; 5.1% were between the ages of 18 and 24; 24.3% were from 25 to 44; 34.7% were from 45 to 64; and 11.6% were 65 years of age or older. The gender makeup of the city was 54.9% male and 45.1% female. ELIZABETH Township, organized September 5, 1870, was named in honor of the wife of Rudolph Niggler, a pioneer merchant and first postmaster, at whose store the first township meeting was held. The city in sections 31 and 32, bearing this name, platted in 1872, was incorporated November 21, 1884. The post office was first called Elizabethtown, 1871-82; it had a station of the Northern Pacific Railroad. The Elizabeth General Store is a full service gas station near Fergus Falls, MN. We're conveniently located at 102 W. Broadway (Hwy 59), Elizabeth, MN 56533. We are just three miles north of I-94 off exit 54, and just down the road from the Red Horse Ranch Arena and right on your way to the lakes! Whether you live in the area, play in the area, or if you're just passing through, make sure to stop in to the Elizabeth General Store for cold drinks, hot coffee, good snacks, ice, live bait, MN lottery, fishing and hunting licenses or whatever else you need to keep you and your family moving down the road!